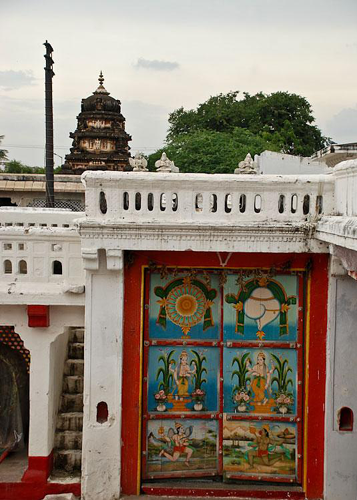 As your drive down the crowded roads in Mallepally near Mehdipatnam ,Hyderabad you see an old temple to the side .A dusty entry road leads you to the famous Sitaram Bagh Temple. Presenting a brief fact file about this temple which is now recognized as a heritage monument. Dr. Arvind Kumar Ganeriwal, a practicing orthopedic surgeon is the current descendent living in the Temple premises and takes care of it .His brother Sri Ananth Prasad Ganeriwal looks after another temple called Rangji temple in Rajasthan. Both are 7th generation descendants of Puranmal Ganeriwal. The fourth Nizam, Nasir-ud- Doula granted a jagir for the upkeep and maintenance of the Sitaram Bagh Temple. The temple won the Hyderabad Urban Development Authority (HUDA) - Indian National Trust for Art and Cultural Heritage (INTACH) Award for the year 2001. The temple complex stands amidst a sprawling 25-acre garden, all of which is surrounded by a 20 feet high wall. 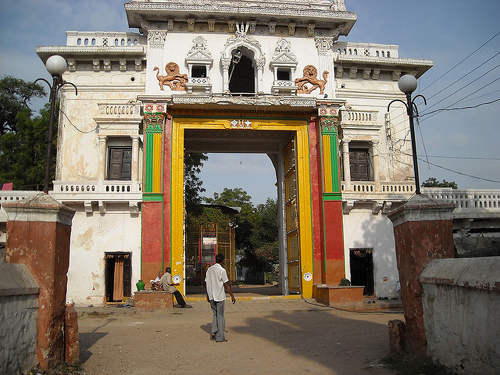 There are three huge gateways, in three directions - East, West and South, The imposing main gateway on the Mallepally-Mangalhat road has a Gopuram sitting on two walls that have balconies in Euorpean style. The entry into the temple premises us uniquely designed leading to quadrangular courtyards, one leading to another placed at right angles. 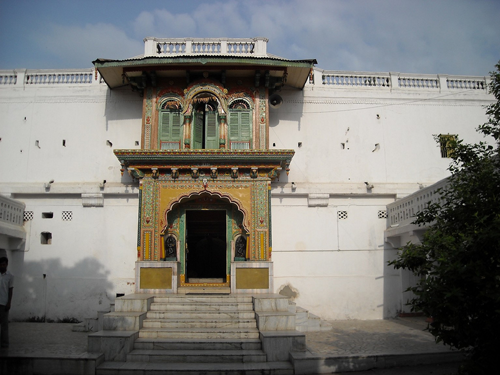 The main sanctum sanctorum is where the idols of Sita and Ram are kept. The idols are made from marble and were specially brought from Jaipur. There inner parts of the temple houses various other deities like Varadarajaswamy, Hanuman, Laxmi and Shiva. The temple has many courtyards in different architectural styles in wood , stone and fusion of both with stucco decorations. It also has 3 step wells, quarters for the priest and those working to maintain the temple. A pair of fluted domed pavilions in Indo-European style was constructed in memory of Puranmalji and his son, Premsukh Dasji in the latter half of the 19th century. The temple is open from 6 AM to 11 PM in the morning and from 4 PM to 8 PM in the evening.